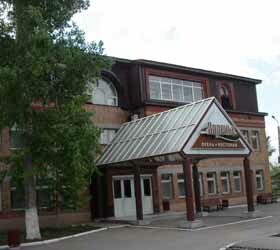 Zarechye Hotel is set in the suburb of Samara city. From here, guests can conveniently reach the airport, the railway station and the downtown with no difficulties. Disregarding the purpose of the visit - be it a business or a tourist trip - guests will feel like at home. The hotel provides accommodation in 32 rooms of various categories - Standard, Comfort, Junior Suite, Suite and Business. Each room includes - TV with multiple channels, telephone, mini bar, Wi-Fi Internet, air conditioning, high quality furniture and bathroom fitment. On-site dining is available at the hotel restaurant with 64 seats, offering a big variety of courses of Russian and European cuisine. The separate banquette hall with 20 seats is available for hosting unforgettable festivities, anniversaries and corporate parties. As for holding business meetings and seminars, the hotel is ready to offer two conference halls with 40 and 20 persons capacity, both equipped with modern technologies - multimedia projector, screen, flipchart, telephone communication, Internet access. In order to rewind after a tiresome trip, guests can attend the hotel's sauna with hotroom, rest room and swimming pool. On top of that, Zarechye Hotel additionally provides - air and railway tickets booking, taxi call, free parking, local and international phone calls, business centre services (PC, printer, Internet), billiards, paddle tennis, mini shop, wake-up hall, restaurant service in rooms, sauna and billiards.